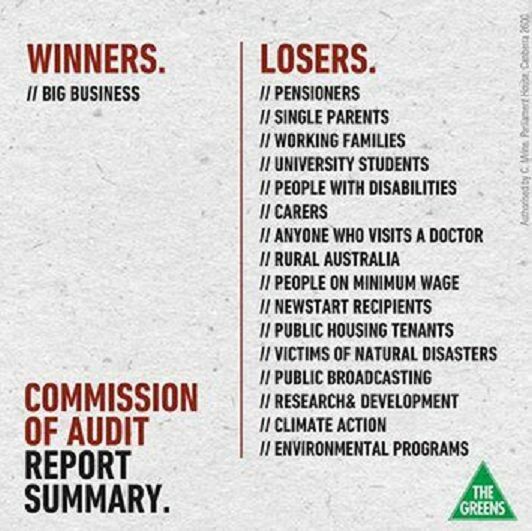 The Greens accurrately summarise the Commission of Audit report. The Commission of Audit report was just a pantomime to help Hockey to sell his fictitious "debt crisis" line. Managing editor David Donovan explains why the Coalition are desperate to continue selling this lie. THE COMMISSION OF AUDIT report has just been released and the Budget is just days away from being delivered. Before discussing these important matters, however, it is important to set to scene. How a nation that is AAA credit-rated and has one of the lowest levels of public debt in the Western world could be widely seen (in this country, not overseas) to be in the grip of a potentially calamitous "budget crisis". Indeed, a debt crisis so urgent that the Federal Government has suggested it has no choice but to remove much of the social safety net, sack thousands of public sector workers and sell off swathes of government assets. Well, it all comes down to the selling off a big lie – the very successful selling, in this case – that the Coalition has been spruiking to the Australian public ever since the previous Government saved the country from the Global Financial Crisis through the use of a modest fiscal stimulus in a quite masterful piece of Keynesian economics. So masterful, in fact, the then Treasurer Wayne Swan was awarded the title of world's best Finance Minister in 2011 and Australia went from having the 9th best economy in the world in 2007 to having the best in 2013. I was aware of the lie for a long time, but its ruthless effectiveness was brought home to me in the months leading up to the 2013 Federal election. It was at that moment that I knew for sure that Labor would lose that election. I was at a party just after Rudd had been returned and Labor were enjoying a brief resurgence in the polls — they were, indeed, back in front. But I knew they'd lose anyway when I asked someone – a personal trainer running his own small business – who he was going to vote for. He said the Coalition — because the country "needed to sort out all this debt". I tried to explain to him that Australia had very low debt in world terms after the GFC, but he looked askance at me and said he had a mortgage so he knew how important it was to manage debt. I told him the level of Australia's debt was like a $50,000 mortgage on a $300,000 house, but he wasn't interested. The message of debt – and the subsidiary image of Labor's "reckless spending" – had been so imprinted in this otherwise very reasonable voter's mind, as it had on the Australian population who get their little bits of "news" from commercial radio or TV, that Labor didn't have a hope. The fearful mind of the electorate – most working hard to pay off massive mortgages or hefty credit card bills – was easy to convince about the bogey-man of public debt. When you are telling stories about bogey-men to impressionable minds, it is irrelevant whether the bogey-man is real or not — all that is required is that it produces the desired emotional response, as it is that response that is imprinted long-term in receptive minds. Thus, the Coalition had absolutely no reservations about pulling out the bogey man of debt — as they don't about debt's bogey-colleagues of asylum seekers, Islam, dole-bludgers, government waste, lefties, socialists, Communists, greenies, bikies, or whoever may seem like a threat in the minds of ordinary Australians. The technique is an ancient one — it is that of the 'big lie'. Everything done by the Government subsequent to the election has been aimed at continuing the public's acceptance of the 'big lie' about public debt, as it is intrinsic in providing political cover for the budget they have long planned to deliver. It was a blatant, obvious lie – or rather a comical series of series of them – but Hockey was reassured afterwards by his minders, I'm sure, that most of the Australian public would never be exposed to this embarrassing disaster by Australia's mostly compliant media. And then came the Commission of Audit. Not much needs to be said about this pantomime performance apart from the bare bones. A few Coalition cronies were gathered together by Hockey and given the express purpose to give life to their most far-fetched Ayn Randian neo-con fantasies, which normally they were only allowed to talk about over brandy in their gentleman's clubs or on their unlistened to ABC radio programmes. For a generous stipend, they duly complied. Some of its recommendations included allowing the states to also levy income tax, removing Medicare for most Australians and privatising the Australian Mint — now there's a licence to print money. As ABC Lateline showed last night, it's key recommendations were eerily similar to the report released by a Commission of Audit in 1997, soon after the last Coalition Government gained power under John Howard. When CoA head Tony Shepherd, the former boss of the lunar right Business Council, released this report, even he was finding it hard to maintain the facadé. He smirked his way through questions, offering glib and often evasive answers. "How did you arrive at that figure, Tony?" a journalist asked him about some detail. "Oh, we just thought they were reasonable payments people could afford," he replied. And that was the sort of intellectual rigour that went into the report. If you want to read a detailed exposé of it, read Ben Eltham's insightful piece in The Guardian. Of course, the detail of the Commission's report was largely irrelevant. Like the previous Coalition Government of John Howard, Hockey will no doubt implement one or two of its less absurd propositions, but will happily ignore the rest. The Commission of Audit was chiefly a stalking horse to make the Government's real plans, which you can be certain have been established for years, seem comparatively reasonable and fair. The main role of the Commission of Audit, however, was to say Australia needed to find a massive amount of money – they somehow came up with $70 billion – to affirm Hockey's big lie that if Government didn't rein in spending soon "we'll all be rooned!" The main game for the Coalition now is simple. To get the Budget through without losing too much political skin so it can pay back the ones who got them elected in 2013 — Rinehart, Murdoch, big miners, foreign multinationals and assorted other plutocrats. To do this, this will first try to the tear away the social safety net and remove workers rights and entitlements where possible. This serves to increase the labour pool and drive down wages. This is important for the big corporations and billionaires, as labour costs are one of their major expenses. The effect this has on Australian society and living standards are of absolutely no concern to the corpulently wealthy. Secondly, and even more importantly for the corporatists, Hockey will privatise anything he can and sell these public assets off at firesale prices. The big lie he will use there is that private industry is always more efficient than government — simply nonsense. The truth is that election campaigns and selling big lies are expensive projects and the corporations will have demanded lucrative public assets at markdown prices as their minimum return. Proof of this is that there is a simple solution to Australia's modest, yet growing, public debt and that is to increase revenue rather than slash spending. Under the Howard Government, the tax take as a percentage of GDP decreased to now become one of the lowest in the OECD. If Howard had maintained taxation rates and not given away the profits of the mining boom in middle class vote bribes, there would be no deficit now. Therefore, the obvious way to increase revenue in a healthy AAA economy with widening inequality is to restore equity through the progressive taxation system – that is, tax the rich fairly – and remove the massive subsidies for wealthy corporations, such as the diesel fuel rebate. Of course, keeping the carbon tax and mining taxes would also greatly assist in balancing Australia's books. The Australia Institute has, indeed, detailed a compelling list of more than $40 billion worth of comparatively easy revenue raising measures that would not inflict a scintilla of hurt on the economy or the poor and underprivileged. These, of course, were not even considered by the Commission of Audit and are consistently deflected by Joe Hockey. That's because none of those measures would be palatable to, for instance, Gina Rinehart — which says all you need to know about who really runs Australia. As Budget night 2014 closes in, we are in the final stages of the sale one of the most massive and audacious lies in Australian history — one monstrous in its implications. It remains to be seen whether the scales will fall away from Australians' eyes in time. Read also David Donovan's speech to the Gold Coast March in March: Down with the corporatists. You can follow Dave on Twitter @davrosz.